TFWSTD would love your feedback! Got a few minutes to write a review? Summary: 'I can keep anyone from getting hurt as long as I...stay out of the way.' Now entering High School, Okuda Manami faces not the world of assassins, but the agony of adolescence- and a redheaded rascal. Full Summary: Okuda Manami now enters her high school life after the unforgettable events of her last year in middle school. But how does a former killer go back to being a regular student in a regular high school? After being shunned by her entire classroom, she decides to keep it that way since she thinks no one can get hurt that if she's out of the picture. No one needs an introverted chemical freak – but that's just when an overfamiliar Redhead decides to get in the way. Karmanami (MAJOR) and other ships coming your way! WARNING: This story was inspired from Kimi ni Todoke, so some similarities may occur. Course it's only SIMILAR and not ENTIRELY the same. Of course I will do my best to remain original, I just thought while watching it 'hey, these two actually fit the story!' or something. You have been warned. DISCLAIMER: I do not own Assassination Classroom or its characters, just the OC's that will be part of this story and some parts of it. They say that if you're completely honest with someone, whether or not those words keep people with you or away from you, they surely will reach them if they're true. My name is Okuda Manami – a former killer and student of the late Korosensei. I'm shy, socially awkward, introverted and very bad with words. And right now, I am a first year student in Kimii High school. At the back row of class 1-C sat a girl with matching braids that fell on her shoulders and glasses that glinted against the sunrays that shone through the window. The girl took notes with half-lidded eyes and her lips were formed into a thin line. In the past month, I accomplished a number of things. I have been able to meet all of my teachers, familiarize myself with the school grounds and memorized my way from my apartment to this building. Number of friends is: 0. The class was holding a study hall, however only this lone four-eyed girl seemed to be taking such a period seriously. When she looked around the room, everyone had already formed into their mini-groups and did anything but what the period suggested. This same thing happened on the first day of school. Since I wasn't exactly a people person, I was quick to be the one that no one was willing to talk to. And many times I've found myself thinking about being in a certain classroom I considered as the place where I belonged the most. When lunch time came, everyone in her class remained in the cafeteria or had their bento inside the classroom, still formed in little groups and having some conversations that seemed to interest themselves. However the case was different for this chemistry geek – whom was now making her way to an isolated bench outside of the building with her lunch in hand – and after putting away the cherry blossom petals that gathered there, the girl silently took her seat and ate in solitude. But compared to the first day, things became much lonelier after last week. And rain clouds began to form above her as they gave off a mild booming sound signaling the coming of a rather strong shower. The scent of exotic mixtures and formulas that wafted from the chemistry lab mixed with the smell of a rain shower pouring down on an average spring day. The sound of glasses clanking to one another and materials being in use indicated that 1-C was about to have their first lab session by testing chemicals and observing them to know when application for specifics was proper. And there in table number five seated Okuda Manami and her partner Mikami Erina. Mikami Erina – the most loved, most beautiful and most popular girl of the classroom; and it's only the second week. She had long, chocolate colored, curly hair that was fixed by a mini ponytail at the back of her head. She had those light brown eyes that seem to sparkle a lot when she's being polite and her form wasn't too fat nor too thin – just the right size standing at 5'4". The heartthrob, the socialite, and the all-around nice girl everyone wants to be with; basically everything Manami wasn't. From the mini scientist's perspective however, all she saw from her was just another girl trying to act air-headed and helpless in front of everyone just so she could have everyone on her side when something she's not in favor for occurs. How did she get that kind of impression? This is just like what happened with Irina-sensei – only, of course, Mikami-san was lightyears away from being as good as she was – and because she spent an entire year trying to assassinate Korosensei, she's had her fair share of assassination education to be able to figure that out almost immediately. Though Mikami-san really acted kind and respectful to teachers and herself, she couldn't help but feel distaste towards the female. But a part of her wishes that she'd be wrong about her lab partner's personality, and that if she is what she makes herself out to be, she'd gladly want to try to be her friend too. Mikagura-sensei, the chemistry teacher (and so far Manami's favorite teacher) pointed to the blackboard with a stirring rod. She walked with long, flowing orange locks that were styled with two clips that made the shape of an 'X' on the left side of her crown. She adjusted her rectangular-shaped black glasses – that seemed to glint with evil – and began with an enthusiastic (yet somehow twisted) smile "These are the chemicals you'll be testing today and make sure you get them right. Be careful with the chemicals dearies~ some of them may cause serious harm. So gloves, hairnets and goggles on at all times~!" The class answered with a monotonous "Yes" after the teacher's instruction. "Good~! Now I'll go out to the Faculty room to get my class record so I can start judging your performace once you're done. Now just follow the procedures on the board and you should all be fine." With that, Mikagura-sensei left the room without another word yet in no hurry at all for the students have only started to work. Some would gather in front of the board to get a good grip on the procedure as others would joke with the chemicals or just sloth about wondering how they would bring about the instruction correctly. But there were others who did things seriously, like Okuda and Mikami's group. Well…at least half of it. "Hey Okuda-san, what should I do with this test tube?" Mikami asked with a high pitched and hesitant tone while holding the test tube with her gloved hand. Manami answered back with a smile – despite being not very comfortable around this girl, the idea of having chemistry class is enough to make her forget her other emotions. Afterwards, the poor Mikami-san was left in a daze and all she could reply with was a hopeless expression and "I'm sorry, I really don't understand chemistry as well as you do, Okuda-san. I'm really really sorry if I'm being a burden to you right now. I'll try to do my best for sure! But I'm pretty air-headed and really clumsy with things so if you please…" she bowed her head as a plea to her. Manami let out an inward sigh of exasperation and just smiled at her partner "It's okay, Mikami-san. I can handle it." Part of her polite tone sounded forced and hollow – though of course Manami failed to notice it. Sure, she had been taught in middle school how to handle her words but she was just starting to get the hang of it. After all, change doesn't happen that fast. And Manami went to work – mixing things that were needed and only taking a few glances at the procedure she's familiarized herself with already back in middle school. To her, this was just a small playground among the world she sucked herself into (thanks to assassination). Occasionally, Mikami-san would offer a hand and try to make herself useful, and she was a few times, but some would end in her feeling sorry for herself once more. The sound of a raging flame filled the entire room for a mere second but quickly died down after Manami had acted fast, and though its effects weren't as bad as the mini-scientist would consider it to be, it seemed to be a big deal for everyone else. "Someone call Mikagura-sensei and the nurse!" The students came over to their table and began pestering Mikami on her condition. Said girl however smiled sheepishly and held on to the piece of her hair that was burned and dyed lighter by the flame that had chemicals mixed into it. But as everyone helped her up and gave her looks of concern, Manami just stared on, unfazed by the incident and simply looked towards the disconcerted group of people blankly. "I'm sorry everyone! Don't worry about me, I got in Okuda-san's way and caused a little accident. It's fine, please don't panic. It's just a simple burn!" the victim tried to reassure the class with that sheepish smile of hers as she held onto the piece of burnt material protectively. But the students continued to obstinately question her about it so she replied with "It's my fault so don't worry about it! As you all know I'm really clumsy and a dummy like me that can't really do anything could never be cut out for something like this. I'm really sorry for getting all of you so worried about me…" Mikami's tears began to form at the edges of her eyes and it seemed as if she was trying hard to hold them in. "Stop being so weak and dumb then." And the entire class was silent. Not a sound could be heard aside from the merciless rain that poured down and crashed onto the roof like an infinite pile of pebbles. Each and every one of the students had looks of shock and anger plastered onto their faces as all of them looked into one particular direction. Mikami Erina stared with a look of hurt and shock at the one who had made such a rude remark. "You're not one to talk!" "Not everyone can be the same as you are!" "And this is your fault in the first place! You're the one who caused the fire! What gives you the right?!" "Everyone go back to your places and sit quietly." To say Mikagura-sensei was infuriated was an understatement. Not only had her class wasted the time period for the experiment, they started showing attitudes she would've chosen not to witness. Next to her stood a middle-aged woman wearing a lab coat; she was graced with pixie-style cut red hair and rather narrow yet intimidating eyes. It was Inari-sensei, the nurse. All Manami could remember was the fact that Mikami had been told to go with Inari-sensei to check on her burn, class had turned silent for the rest of the period, and that she was given sour looks the entire day. "Yo." She said with that high-pitched voice of hers and a polite smile as her hands were entangled behind her. Mikami took a few steps forward so she was now a meter away from her earlier lab partner. Manami only looked at her with a startled expression but she soon greeted her. "G-Good evening, Mikami-san"
An awkward silence ensued and Manami was beginning to feel uneasy with only herself and this girl left in the building. The chemistry freak began looking to other directions and twiddling her fingers nervously behind her back. There was something unusual about the atmosphere around Mikami – something that isn't too pleasant seemed to be coming from her presence itself which caused Manami to step back a bit from the fellow student. But soon enough, Mikami spoke. "We were in a bit of a tight situation earlier today, huh?" she started off, kindly like she always did. Manami simply looked at her, not really sure what she was supposed to say, so she gave a simple nod and a hum sound. Silence again. This time there was a bit of tension in the air as the two stood only a meter apart, unmoving and completely silent. Now for some reason, Manami only wishes to go home, to be rid of this growing anxiety and just sit in her room to read some of her books, to brew herself a cup of coffee, to simply call it a day and not deal with this right now. An introvert such as herself could never really grasp these kinds of situations well. "Hey, Okuda-san. I heard you were from Kunugigaoka Middle School, Class E, correct?" there was something just a tad bit off with this tone compared to the usual one, but Manami decided to overlook it for the meantime and answered with a slightly dull tone "Mhm." "And you were able to make it to this school? You must've had a wonderful teacher! It's a shame though, I heard he passed away last year…" then something was evident in her tone, a slight aggression was present, but Okuda, being how she is, was unsure of how to respond to such a tone let alone act around it. So many questions were filling her head all at once. Mikami looked to the side, the usual shine in them somehow faltered and she was giving the science maniac a small intimidating look, as if she's expecting her to say something. "Hey, Okuda-san, about your words earlier—" Just then Manami cut the taller female off with a statement of her own. "U-Um! M-Mikami-san! A-About earlier uhm…well…" she stuttered out as she fidgeted uncomfortably, the grip on her school bag tightened as she said the next few words with her eyes travelling everywhere except Mikami's face. "I don't re-regret any of the words I said because that's…really how I feel about what happened earlier…"
"I-I mean, if you don't like being a bu-burden like you said then maybe you should stop acting like that and do something about it—"
At this, Manami's eyes grew wide. She faced the angered expression of Mikami Erina – a face she didn't know she was capable of doing. The tone she had right now, it didn't even sound like it belonged to her. It was deep, threatening, and just downright unfriendly. It invited nothing and only presented hostility. Seeing this kind of behavior from her would've given anyone a chill through their spine, she knew that Mikami Erina was playing nice, but she didn't think this kind of monster lived beneath that façade. "Mikami…-san…?" she slowly uttered out before she was shoved to the shoe locker and caged with one of Mikami's arms at the side of her head. The loud clang echoed through the empty hallways of the school. Manami's eyeballs had shrunk as they locked stares with Mikami's dangerous ones. "I'm just about sick of being so nice to you! You…you're just an anti-social science geek! You don't have the right to speak to me like that because…" Mikami's gaze faced the floor as she yelled "An introverted, cold-hearted killer like you will never understand!" And that's when Manami felt a chill go up her spine and if her eyes could get any wider than they already were, they grew wider. She let out a surprised gasp and not a moment later Mikami was facing her again. "Yeah, I know what your class did last year. You were expending your days, training yourselves to be killers! And if I'm not mistaken, your target was your teacher? The one that gave you the capability to actually survive middle school with your rock-bottom grades? How cruel can that get?" It was Okuda's turn to have her mouth agape at her words. She remained caged in this mess. Her knees began to shake along with her hands out of anxiety and just pure tremor as each word registered in her mind. What was causing this? Was it what you called a 'blast from the past'? Was it the memory of her teacher's death haunting her once more? Was it the sudden realization that she was once, for a good cause or not, a…killer? "Hm? That's a good face your making." Mikami's tone had turned sinister. "Once this gets out, do you have any idea what will happen to you? You're already being avoided by people which is bad enough, but once they find out what you were, what then? I know, they'll hate you—No, they'll fear you. No matter how much you want to change or how much you want to make friends, everyone will loathe you for the very fact that you have blood on your hands. And don't you see? Anyone can end up getting hurt being around the likes of you. Understand? So…" Mikami exhaled, lifted her palm from the locker and rested it on her hip to look at Manami's (to her) pathetic, lost face. "Why don't you just…continue staying out of everyone's way? Don't you think maybe that way…you can keep anyone from getting hurt? Even yourself?" 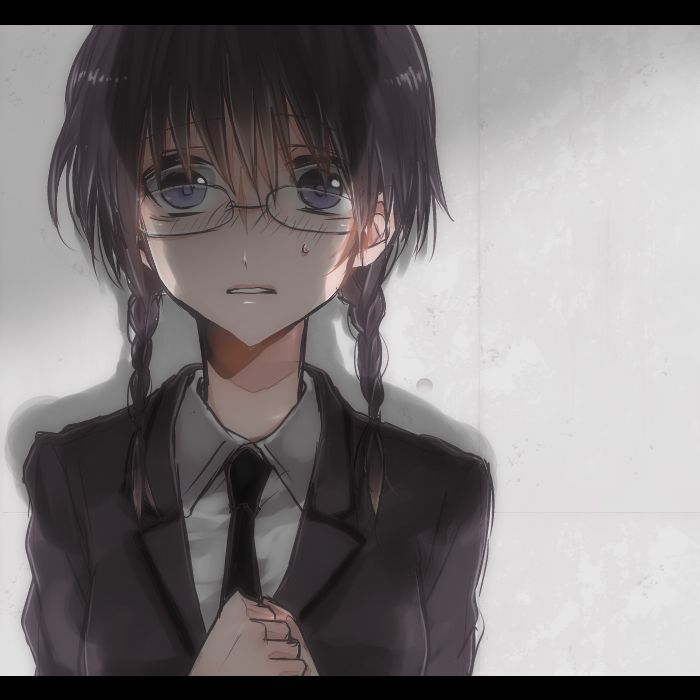 From that statement, something surged within Manami causing her to look back at a small memory from long ago. The blurred image of a figure standing in front of her – it looked like this person was protecting her against a few rough looking boys in an old elementary school. But what was really eye-catching in this flashback was the fact that there was red trickling down the face and arm of the one trying to defend her. And Manami's arms fell lifelessly to the side. It's been almost 3 weeks since then. Mikami-san transferred to another school 5 days ago, but the effect she left on the school and I remained. Thunder boomed loudly across the sky, enveloping the town in some kind of dome of loud sounds. Large droplets fell from the heavy clouds that covered the clear blue skies of spring, mimicking the sound of a million tiny stones falling from high ground. And under the heavy rain, a girl held her transparent umbrella on her right hand, her school bag in the other. The road her feet tapped upon would've had a nice view if it weren't for the rain. To her left, there was a river and a bridge connecting the two sides of town, and to her right was a straight unending line of blooming cherry blossoms. I continue in a solitary manner, just like always. This is my path home. Sometimes, I would catch myself thinking about my old path to school, and how my current path is so much easier compared to the one I had to take just to get to class E.
She chuckles at the thought of having to climb some kind of mountain only to be met with an old, run-down building in the end – where there wasn't much technology that can be used, or clean/ brand new appliances for cleaning and other tasks. But she didn't mind that, in fact, she considered the walk to be worthwhile, for in the end, she'd meet faces that weren't unfamiliar to her, faces that acknowledged her for the skills she possessed that were beneficial to the assassination of her favorite teacher. And that was the most part; she'd be able to see her out-of-the-ordinary (inside and out) educator. Rain continued to fall without remorse as she walked up the fire exit's stairs to her apartment, 560. After her umbrella had been folded, and placed neatly into a plastic to prevent the floor from getting wet, she suddenly felt a rusty taste in her mouth as she opened the door, and from there she prepared herself for the next lonely day. The chime rang, symbolizing it was lunch time yet again as students were immediately scattered around the school as soon as they were done bowing. Now Manami followed her usual routine and took her lunchbox – which was neatly wrapped around with a purple towel. From here, she slowly walked her way to the 'haunted' bench where she would have to put away another set of cherry blossom petals. It would be another hour before she would have to walk back to her building which was a relatively far distance from the wooden chair. I'm pretty sure she prepared me the same bento since I haven't gone grocery shopping yet…I guess I should go after school today. With a sigh, Manami made it to her destination, padding away the pink petals once more and sitting herself down on the right side. Usually she'd sit on the middle of the bench but there was something occupying the left most side of the bench right now so she didn't want to be rude and sit too close to it. From the moment she turned, she found herself staring into mercury colored eyes and short red hair that matched it perfectly with widened eyes. At the sight, her jaw dropped a tad – the hold she had on her chopsticks loosened and they (luckily) fell to the lunch box. In turn, the boy she was looking at also harbored a rather surprised expression as he had his mouth claimed by the straw of a juice box he held in his right palm.